On a roll at the moment with another finish. I have decided to start a "gift basket"
so this is going to be the first thing to go in it. Enjoy what is left of your Monday. lovely finishes. 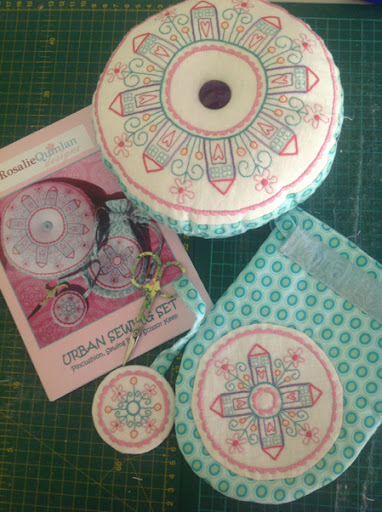 I have the urban stitches pattern too, I think it will have to be holiday stitching project. Love the hexies on the print fabric. Gorgeous set Sharon, it's such a pretty pattern. Love the little hexies too. Beautiful Sharon....I need to start a gift basket too...great idea. Your project looks wonderful! Haven't started mine yet! 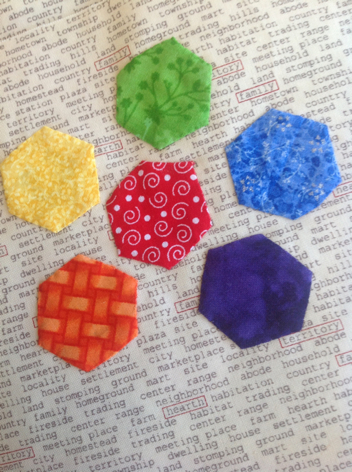 Love your finished project and the hexie's have me curious....don't keep me in suspense for too long lol :) Barb. Hope beautiful! Gift baskets are a great idea. I really love that pattern of Rosalie's....your stitching is beautiful!